After blogging the other day about something that upset me in Glastonbury, today I wanted to blog about an amazing experience I had in the town at the end of my holiday last weekend. 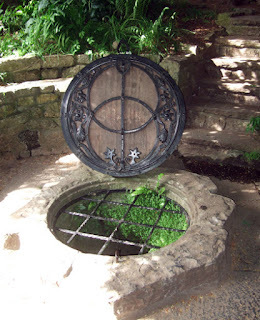 One of my reasons for stopping off at Glastonbury on my way home from Cornwall was to visit the sacred wells - the white spring and the red spring. I always love to go to both of them when I am in the area - in fact that is often my main reason for going. Chalice Well, the site of the red spring, is in a beautiful garden setting and is the perfect place for meditation or just quiet contemplation on a sunny, warm spring day. The picture to the right shows the well head, but further down the path is a fountain that you can drink from and a small pool of ankle-deep water that you can dip or paddle in if you want to. The white spring, just across the road, is in a building set into the side of Glastonbury Tor. Inside, it is almost dark - only lit by candles. There are shrines at various places and water running in channels that weave across the tiled floor. In the centre is a huge, round pool with steps leading up to the edge, that you can bathe in if you want to. I had never done so before, but that day I felt I wanted to wash away the lingering disquiet I felt after my earlier unpleasant experience, so I took off my clothes and immersed myself in the dark water. It was very cold, but wonderful. I was lucky - the only people in the building at the time were me, my husband - who held my clothes - and the keeper tending the spring that day. And, when I climbed in, the keeper began playing music on a flute. It was the kindest thing I could imagine. The entire experience was amazing - and proof that Glastonbury is home to the loveliest people imaginable. Note: Photography is not allowed inside the white spring building, mobile phones must be switched off at both springs. That's great , I am glad you went home not thinking badly of us Somerset people. I love Glastonbury and (nearly) all the people there are are absolutely wonderful!